The ports along the U.S. East Coast (USEC) are currently operating but have begun to prepare for Hurricane Florence’s arrival over the next 48-72 hours. 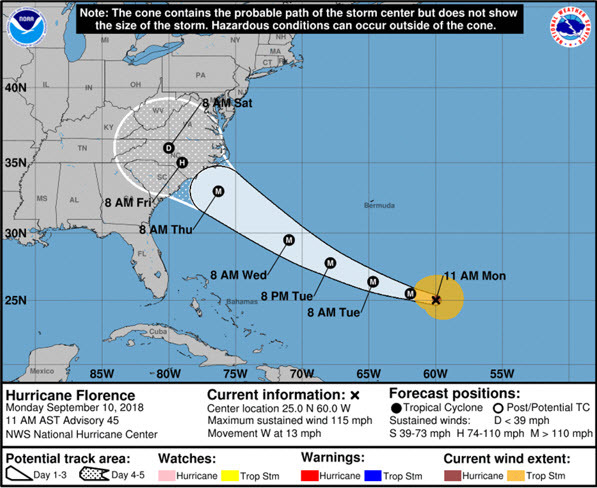 Florence is forecasted to be a dangerous major hurricane making landfall near the southeast U.S. east coast by late Wednesday or early Thursday. The storm winds had increased to 130mph as of late yesterday. Ocean carriers advise they are in contact with the U.S. Coast Guard, ports, terminals, and the rail and trucking industry to ensure they have the latest updates. The carriers are recommending customers with high value reefer and other import cargo to pick it up from your local port as soon as possible, due to the risk of flooding and port closures in the days ahead. CSX and Norfolk Southern (NS) are monitoring the situation. On Monday, September 10, at 6:00pm the Norfolk Southern stopped accepting intermodal shipments at all origins destined to Norfolk (Portlock), Norfolk International Terminal (NIT), and Virginia Inland Gateway (VIG). All NS Intermodal facilities continue to operate under normal hours; however, gate and terminal closures may occur as Florence nears landfall. Pending a more detailed update for CSX and other states later today, September 11. We expect to receive more details from our trucking companies today as we monitor the storm. The Governor of South Carolina has issued a mandatory evacuation for Charleston beginning today at noon. All lanes on all major roads/lanes leading into Charleston will be reversed away from the coast. Effectively, there will be no way to get to the ports after noon today. On Tuesday, September 11, all truck gates will close according to posted hours (business as usual at all Port of Virginia terminals). HARD STOP for all terminal activities at 2359 hours on Tuesday, September 11. All vessels to depart Port of Virginia berths. MIQ Logistics will continue to monitor any service delays and/or routing changes that can impact transit times. We will provide updates as they are available.